The first secretaries were men because to be a secretary required a unique skill set best suited to the male of the species – detail orientated, thorough and a stiffly starched collar. 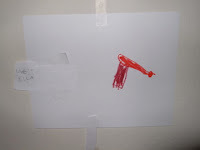 It is therefore with some trepidation that I attempt to assist the child that insists upon a writing style that he considers to be an accurate copy of how a robot would write, namely that each letter is formed on a underlying and invisible cube. His industry in the morning is unfathomable to a bleary eyed parent. My only purpose is to pre-empt a meltdown of frustration that would wake the rest of the sleeping household. “How you are spell 'like'?” Instead of saying the letters verbally, I write them on my trusty wipe board. “How you are spell 'sumpfing? '” We continue in this mode, until he has a small paragraph. The brave fingers of the tactile defensive child, attempt to fold the paper. He whips his index finger away on completion to blow frantically on the tip, scorched. He turns it to me, to touch my numb lips so that I can gesture a kiss better. “Where we are live?” I sing him our address to it's familiar but irritating tune, softly because we are not supposed to “sing our vital statistics” any more. [link] By now his wrist and hand are beginning to tremour with the effort and strain involved. 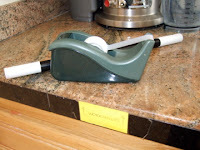 He fumbles with tape, careful to avoid the serrated edge. He exhales, a sigh of exhaustion, the satisfaction of 'done.' He spins off the chair and scampers upstairs on his tippy toes, to his bedroom. I follow. 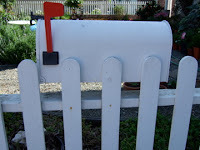 I watch him insert his missive into the mailbox that he has made for his sister, close to the one that he has made for his brother. 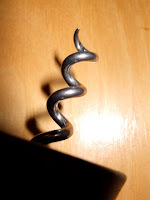 There again , maybe that's part of the “corkscrew” effect, when skills become embedded, connect to each other and manifest themselves in triumphs of progress?